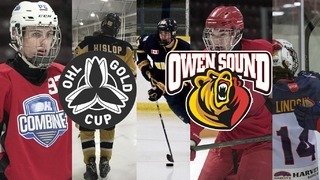 The Owen Sound Attack look to build on the momentum of their overtime win last Saturday and begin the push to the postseason. This is your Joe Tomato’s Weekend Preview. 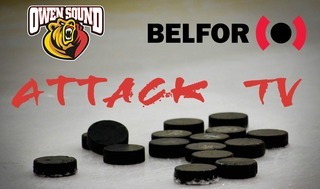 The Attack begin their week with a trip on Highway 26 to visit the Colts on Thursday night at 7 p.m. The home team has won every game so far this season between the two teams, with Barrie holding a 2-1 advantage in the series. While it will no longer be the Suzuki vs Suzuki show, Ryan Suzuki is still a dangerous top prospect that can put up points in a hurry. Netminder Jet Greaves was incredible last weekend with back to back 50 save performances to lead the Colts to a victory and salvage a point in a shootout loss. The Colts are currently last in the Central Division and 5 points out of a playoff position in the East, but they’re always a tough match at the Molson Centre. 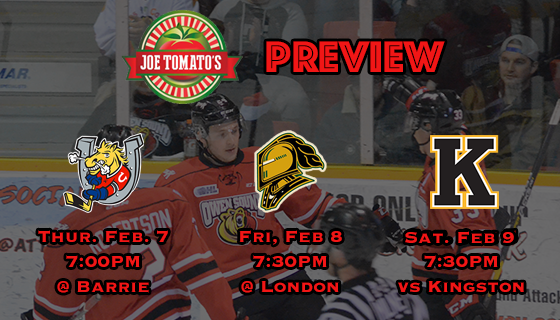 The week continues with a visit to London on Friday for a 7:30 p.m. puck drop against the Knights. London currently holds the #1 seed in the Western conference, just two points behind Ottawa for 1st overall in the league. 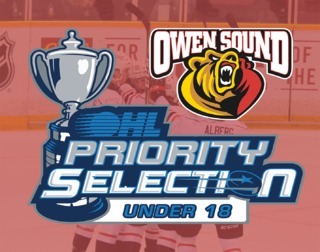 So far this season Owen Sound has played them well with a 2-2-1 record in five games. This meeting will mark the first game for Kevin Hancock against his former team in a gold and green jersey and shutting him down will be a priority for the Attack. Sergey Popov and Andrew Perrott will be looking to have a big game against their former team. We wrap up the weekend with our third game in three nights against the Kingston Frontenacs, back in the friendly confines of the Bayshore. Saturday night is REACH. Shoot. Score! night at the rink with special jerseys, a puck toss, a live jersey auction and more all benefiting the REACH Centre of Grey/Bruce. Kingston is currently last in the Eastern Conference and head into the weekend with an 8 game losing streak. Ryan Cranford currently leads the Fronts with 13 goals and 17 assists for thirty points on the season, and Brendan Bonello is always a threat to steal a game. 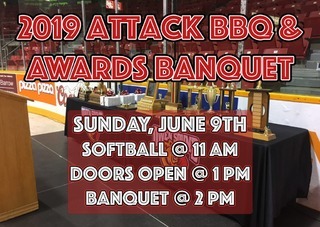 After every Attack home game, you can take your ticket stub to Joe Tomato’s for half-priced wings and appetizers. Tickets from January 30th can be used through the month of February at any time.